About a year ago I was in Toronto with some journalists, including one from Germany. He had been to the US many times but it was his first trip to Canada. He remarked that he thought Canada would look different somehow. The truth is, when you travel to Canada from the United States, it doesn’t always look very different. Especially on the surface. The U.S. has a lot in common with Canada, but there are some subtle (and not so subtle) differences. One difference? Candy bars! The candy bars in question are made by Nestle and Cadbury, but they are not the same as candy bars in other parts of the world, and none of the ones I brought back from my last trip across the border are available in the US, not that I know of anyway. I’m not much of a candy bar fan, and these are everyday, available-in-the-supermarket candy bars, but I still think it's fun to try something different now and again. The Coffee Crisp is my favorite. It’s light and crunchy, a bit like a Kit Kat bar but with a distinct coffee flavor. It's made in Canada and has layers of vanilla wafers and a coffee filling. There was actually a campaign to bring this bar to the U.S. The Wunderbar was recommended to me by another traveling companion and pal, the Global Gumshoe. It has many of the flavors of a Snickers bar and the texture of a Butterfingers bar. It has a light crispy crunch, and mild peanut flavor but no crunchy nuts. It is very thick and chewy with caramel. Mr.Big is a bit like a lighter version of the Wunderbar, cararmel, peanuts, crisp vanilla wafer and rice crisps, but much more delicate. And well, bigger. 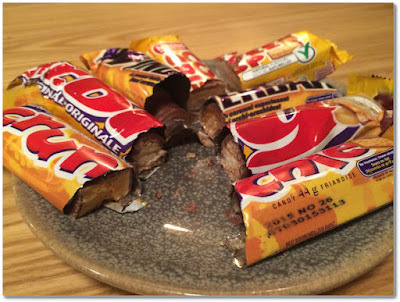 The Crunchie is another top pick, a bit like a Violet Crumble it’s a honeycomb toffee bar, though the chocolate coating is milk chocolate and very sweet. The airy texture and richer flavor are very appealing. 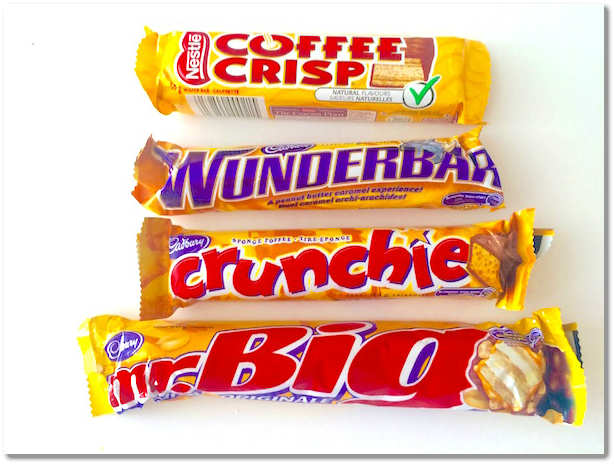 What candy bars do you like to bring home to the US? Or from the US if you live abroad? Let me know in the comments. Curious about my trip to Canada? Check out this terrific video of Nova Scotia from the Global Gumshoe --and see if you can spot me!